After seeing everyone and their mother use the Too Faced Born This Way foundation, I felt like I was missing out on something amazing. A couple of months ago, I decided to make a cheeky Debenhams order and purchase the foundation. But was it worth it? Ordering foundation online is always a risky business. Or should I say was? At £29.00 a bottle, I wasn't prepared to get the wrong shade. After a quick Google search, I found MatchMyMakeup, a foundation comparison website, and popped in the details of my other foundations to find out what Born This Way shade I should purchase. It recommended, and I ordered, the shade Light Beige and it is a perfect match. I believe they have around 30 shades in total. The Born This Way foundation is an oil-free liquid foundation, which is a blessing if, like me, you have combination-oily skin. The added bonus of coconut water and hyaluronic acid claims to keep the skin perfectly hydrated and smooth. I knew from the first time I tried this foundation that I was going to love it; it has a gorgeous, flawless finish. It's not too matte and not too dewy, and just gives a nice, natural looking glow to the skin. I have tested application with both a brush and a beauty sponge, and whilst both worked, I much preferred the finish my Real Techniques sponge gave. I haven't found that the foundation oxidises on my skin, however everyone's skin is different so please do not take this as a guarantee that it won't oxidise for you. One of my favourite things about this foundation is that is has incredible coverage without being too heavy on the skin. It is easily buildable; if you just want medium coverage, you can wear a light layer or if you prefer a full coverage, you can build it up. A concern for me with most foundations is whether it will work with my other products, mainly concealer. I have too many concealers to count and no word of a lie, this foundation seems to work with all of them, blending easily for that "no make-up" look. 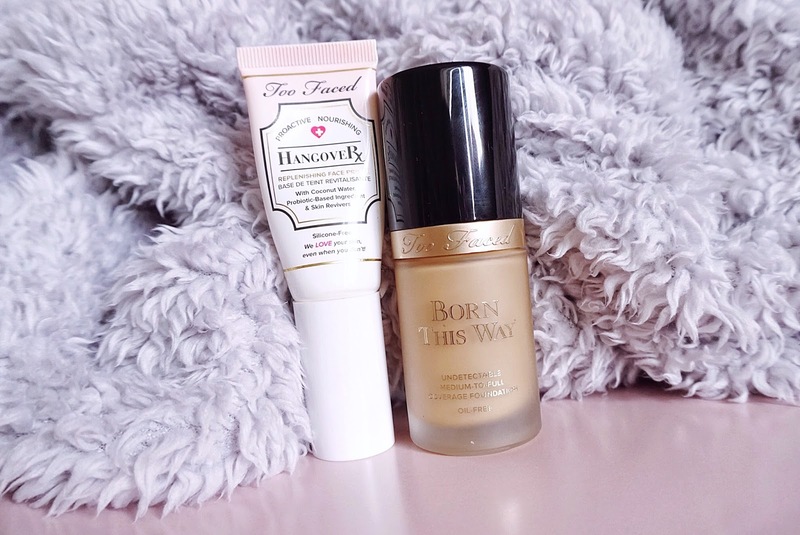 I also picked up a travel size of the Too Faced Hangover primer, a new favourite, and I've found that the foundation works best for me and has the best longevity if I use the NYX Angel Veil primer on my nose and then the Hangover primer on the other areas of my face. As Winter fast approaches, I'm glad that I've purchased a foundation that keeps me glowing throughout the day, needing minimal touch-ups. I'm sure this will be a staple in my make-up bag for many months to come and I'm excited to try more Too Faced products. What base products are your favourites? so many people rave about this but I've never actually purchased it, the coverage sounds brilliant so I must!! I have never tried this foundation and I literally have no idea why?! I love too faced and i too have combination skin! I really want to try the Too Faced primer and now I'm super interested in the Born This Way foundation as well. Really wanna try this but I’m skeptical as I’ve heard it’s not one for oily skin! I have just started using this foundation literally this week! So far so good! Hopefully it might become a new favourite... My current favourite is Tarte Amazonian Clay by far that stuff is amazing!